The Palace of Arts It delves into the lesser known repertoire Giuseppe Verdi with I masnadieri. This work opens in the Main Hall next Wednesday, 6 February, and will feature more functions day 9, 12, 15 Y 17 February. Tickets can be purchased on the webl Palau de les Arts. 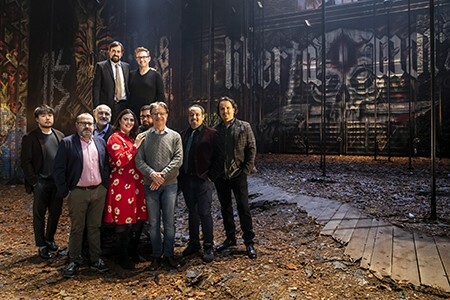 The artistic director of the Arts, Jesus Iglesias Noriega, This was highlighted in the presentation of output to the media, accompanied by musical director, Roberto Abbado and major soloists: Stefano Secco (Carlo), Roberta Mantegna (Amalia), Michele Pertusi (Massimiliano) Y Artur Ruciński (Francesco), along with the stage director replenishment, Allex Aguilera. I masnadieri, as he explained by the maestro Abbado, It is the first international custom Verdi, which he started at the same fruitful relationship with one of the most important thinkers of the Age of Enlightenment: Friedrich von Schiller. It is a key work in the development of musical and theatrical author, written straddles the storm and stress -the momentum and the storm- and the primal Romanticism, from which it takes and develops a strong sense of melancholy, a rhythmic and vigorous momentum, the idealism of the young philosopher and the same desire for freedom Verdi Risorgimento. Released in Her Majesty's Theater in London 1847, the genius of Busseto had the collaboration of one of the great intellectuals of his time, Andrea Maffei. Reference to the Italian translator of the work of German playwright, Maffei became four hours of intense drama "Die Räuber ' ('The bandits') a booklet two hours condensed in action blocks. Verdi composed, Roberto Abbado as explained, an impressive score, feelings of great wealth, ranging from tenderness to violence. further, He wrote an extremely demanding music for both protagonists roles as primary, in which, novelty, places the chorus as the main character. 'I masnadieri' demands four premier interpreters, in which as noted Noriega Iglesias, include debuts in Valencia de Stefano Secco and Roberta Mantegna, and the reunion of two voices appreciated by the audience of Les Arts: Michele Pertusi s Artur Ruciński. Stefano Secco encarna Carlo, Bandit hard and violent and very nostalgic turn, reflecting the prototype of the romantic hero folded inside, Difficult to interpret, according to the wording, in times of serious Donizetti staff they are recognized with complex execution cabalettas. Artur Ruciński, Baritone international reference, He gives life to brother Carlo, Francesco, dark psychology paper, very similar to Macbeth Verdi musician on the same year. Polish singer, I always discover something new in the character, it stands out for its uniqueness compared to other Verdian roles for his tessitura. Michele Pertusi low, that the Valencian audience will remember for 'Don Pasquale', Massimiliano role debuts, father Carlo and Francesco. It is a "vocativo role", Interpretation fairly concentrated and energetic, whose demands carrying first Verdi to the mature stage of the composer. Close the quartet, Roberta Mantegna (Amalia), the only woman in the work, a role that Verdi wrote for a diva Jenny Lind his time, renowned coloratura soprano; a role that according Mantegna moves between the dramatic and magical, and that only through death receives the status of heroin. Dominik Chenes, who will sing the role of Carlo Day 15, Bum Joo Lee (Arminio) Gabriel y Sagona (Moser) complete a cast, also he participates in the Ukrainian tenor Mark Serdiuk (Rolla) the Center Placido Domingo. Allex Aguilera has led the revival of the production of Gabriele Lavia for theaters San Carlo in Naples and La Fenice in Venice, Alessandro Camera with scenery and costumes by Andrea Viotti. Aguilera and Nadia Garcia, The team of the Arts, also sign lighting production. Allex Aguilera pointed out that the essence is respected assembly, of posmoderno cut according Lavie, adapting it to the performers and personalities to create a completely new show.